This document is the user manual for the CUBA Platform business process management subsystem. This manual is intended for developers who use the CUBA platform to create applications with business processes management functionality. It is assumed that the reader is familiar with the Developer’s Manual, which is available at https://www.cuba-platform.com/manual. This manual, as well as other documentation on the CUBA platform, are available at https://www.cuba-platform.com/manual. CUBA business process management subsystem is based on the Activiti framework, therefore general knowledge on the framework is beneficial. See http://www.activiti.org to learn more about the Activity framework. An executable process description employs the BPMN 2.0 notation. Consequently, it is assumed that the reader is familiar with the notation. More information about BPMN 2.0 specification can be found at http://www.bpmn.org. If you have any suggestions for improving this manual, please contact Technical Support at http://www.cuba-platform.com/support/topics. When reporting errors in the documentation, please indicate the chapter and surrounding text to point the error. In this chapter, we will create a small project to demonstrate how to use the business processes subsystem. As an illustration we will implement a contract approval process software. A user creates the Contract object, defines actors and initiates an approval process. An actor with the Controller role receives the task to validate an attached contract. If the validation is passed then the contract is transferred to the users with the Manager role assigned, otherwise the process will be terminated with Not valid state. After the associated managers approve or reject the contract it turns, respectively, into the Approved or Not approved state. Press OK button at the project properties page. The system will ask you for the confirmation. Agree. Go to the Entities tab and press New entity. The class name is Contract. Go to the Instance name tab. 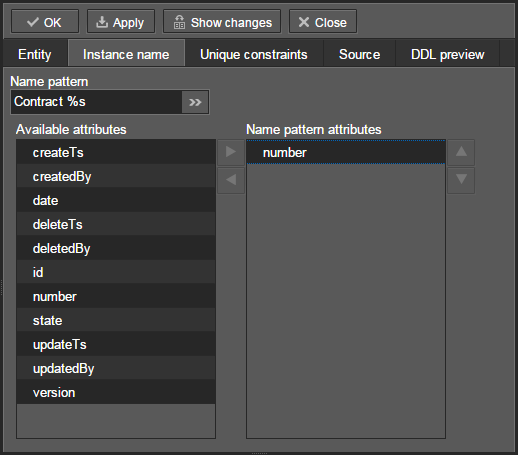 In the Name pattern field enter the value Contract %s and add the number attribute to Name pattern attributes. Press the OK button to save the entity. 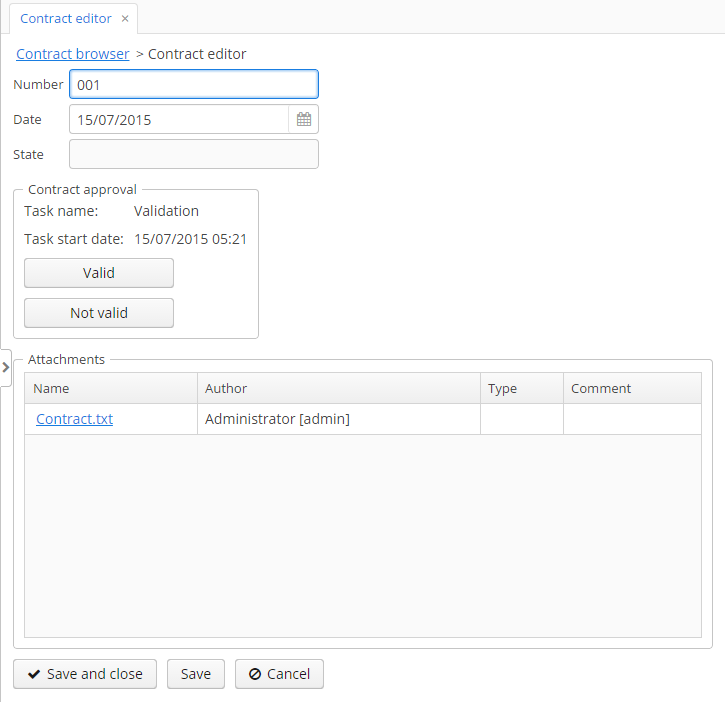 In the Entities section of navigator panel select the Contract entity and click the Generate standard screens button. Default values of the screen creating window suits us, so just click Create. The updateState() method of the ApprovalHelper bean will be invoked from the contract approval process for setting a contract state. Open the project in an IDE. 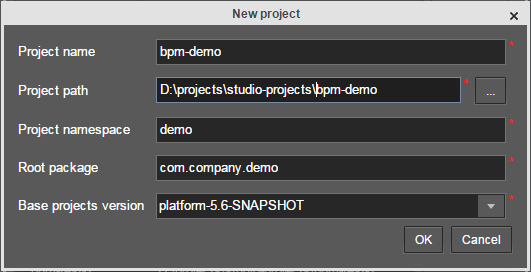 A simple way to do it is to use an IDE button from any section of the Studio navigator, e.g. Project properties. Create a package com.company.demo.core in the core module. Create ApprovalHelper class in this package. 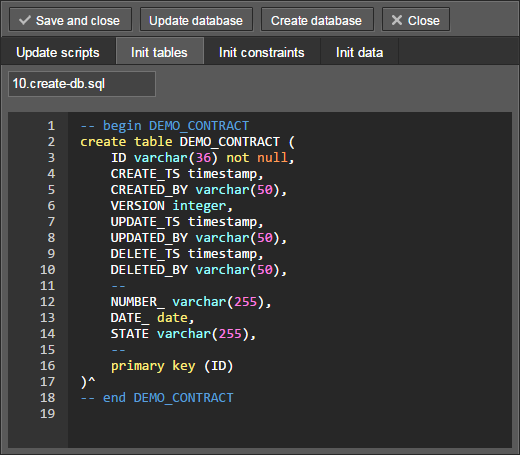 Press the Generate DB scripts button of the Entities navigator section. In the database manager window press the Create database button. Start the server with Run → Start application server command. Open the application in a browser at http://localhost:8080/app or just click the link in the bottom of Studio navigator panel. Let’s look at the sequence of steps to create the model. 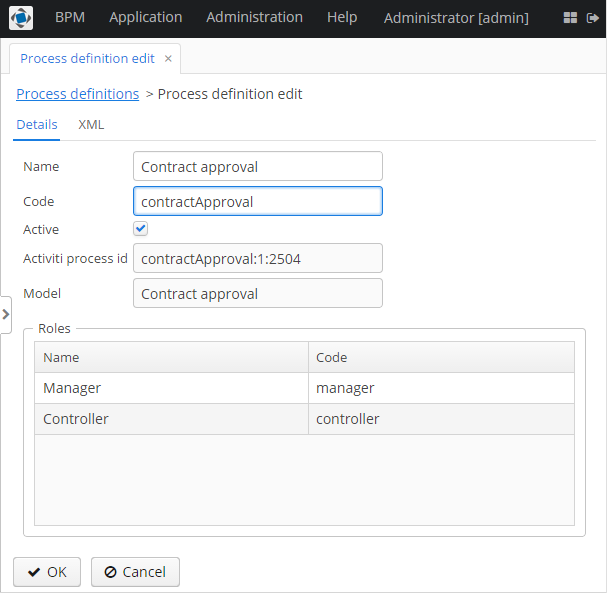 Open the screen BPM → Process models in the running application web interface and press Create. Enter the model name Contract approval and press OK. A new browser tab Model editor will be opened. Select the Process roles property in the model properties panel. The process roles edit window will be opened. There are 2 types of actors participate in the process: a manager and a controller. Create 2 roles: Controller and Manager. Add the User task node from an Activities group to the model. Name it Validation. 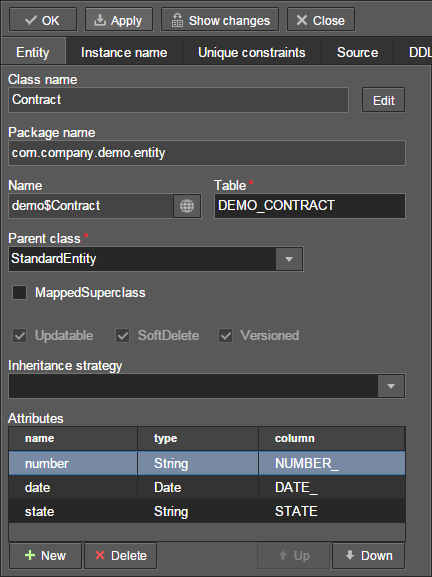 Select this node and assign the controller value to the Process role property at the properties panel. This is how we defined that the task will be assigned to a process actor with controller role. Next select the Task outcomes property. The window for task outcomes edit will be opened. Outcomes define possible users actions when users receive tasks. Create 2 outcomes: Valid and Not valid. Define the Standard form for both outcomes. 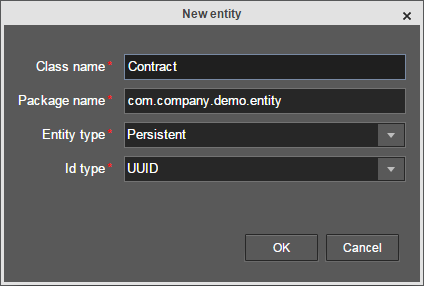 Add form parameter commentRequired=true for the Not valid outcome, because we want to make a user add a comment in case of invalid contract. Depending on the controller’s decision we have to send the contract to managers approval or to finish the process with the Not valid state. The Exclusive gateway node from the Gateways group is used to control the process flow. Add it to the workspace and then add 2 more elements: Script task with Set 'Not valid' state name and User task with Approval name. Name the flow to the Script task as Not valid and the flow to the User task should be named Valid. Select the Not valid flow. Expand the dropdown list Flow outcome from the properties panel. It shows outcomes from the tasks before the gateway. Select the Not valid value. Now, if the Not valid outcome is selected, a transition to this flow will be performed. The Valid flow should be marked as the default flow (if no other flows condition are true). Select the Valid flow and tick the Default flow property. Next select the Exclusive gateway and open its Flow order property editor. Make sure that the Not valid flow goes on the first place in a list. If it is not true then change the flows sequence. You are allowed to use the process variables and platform objects persistence and metadata (see CUBA Platform. Developer’s Manual) in scripts. An entityId variable is created on process start and stores an identifier of the linked entity. After the contract state is changed, the process should be finished. Let’s add an End event node from the End events group to the workspace and link the node with the Set 'Not valid' state. Let’s go back to the Approval task. Define the manager process role for it like we did for the first task. In order the task to be assigned to many managers simultaneously set its Multi-instance type property to Parallel. Create 2 task outcomes: Approve and Reject (Task outcomes property). For both outcomes set the Standard form form and set commentRequired parameter to true for the Reject outcome. After the approval is completed, or Approved either Not approved status should be assigned to the contract depending on the approval result. Add an Exclusive gateway node after the Approval task. Add 2 Service task after the exclusive gateway: Set 'Approved' state and Set 'Not approved' state. They will do the same thing as the Script task we added earlier, but in another way. They will invoke a Spring bean method. Name the flow to the Set 'Approved' state as Approved, and name the flow to the Set 'Not approved' state as Not approved. 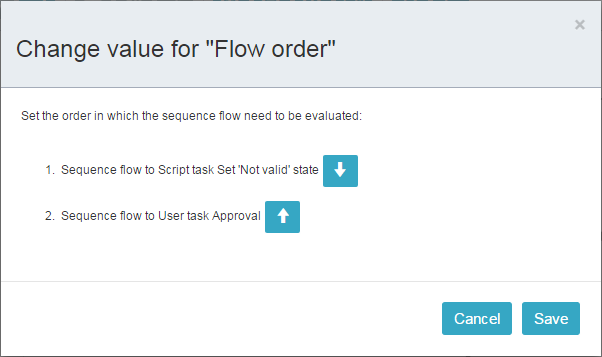 Select the Not approved flow node and select the Reject value in the Flow outcome list. Now if at least one of the managers performs the Reject action then this outcome will be initiated. 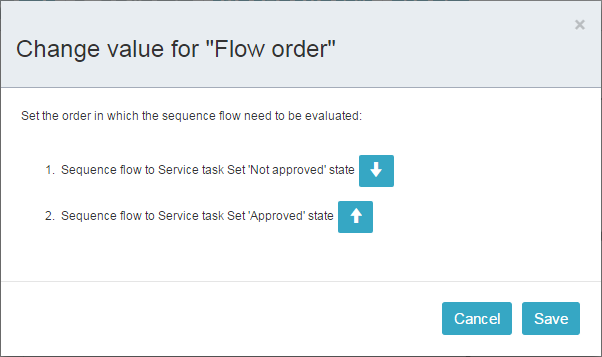 Select the Approved flow node and check the Default flow checkbox. This means that if no other flow is initiated then this flow will be used. Set the flow order for the Exclusive gateway like we did for the previous one. Select the Exclusive gateway and open the Flow order property editor. Not approved should be processed first. Activiti engine is integrated with the String framework, so we can access Spring managed beans by their names. entityId is a process variable that stores an identifier of the contract which is linked to the process. Its value is set on a process start. Link both Service tasks with the End event and press the save model button. The model is ready and we can move to the model deployment. 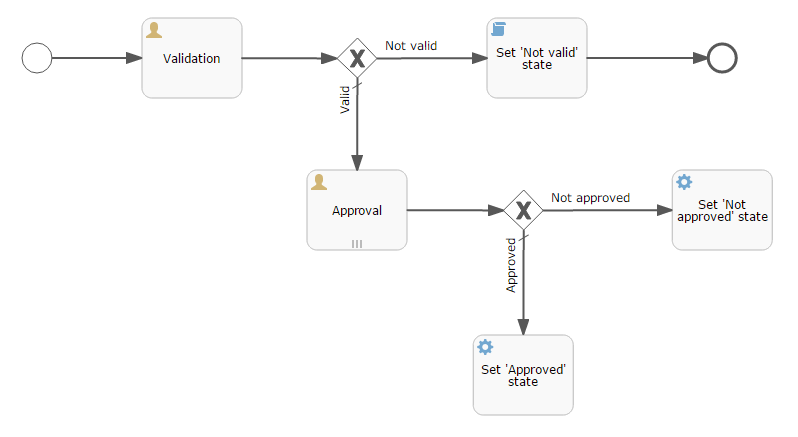 Generating a process XML in BPMN 2.0 notation from the model. Deploying the process to Activiti engine internal tables. Creating a ProcDefinition object that relates to the Activiti process. Creating ProcRole objects for process roles defined in the model. 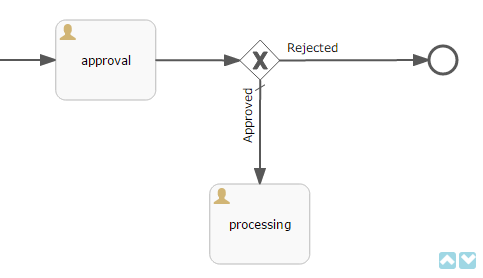 Select the model in the list on the Process models screen. Press the Deploy button. The model deployment window will be displayed. The model is deployed for the first time, so the Create new process option is selected. You will be able to deploy the model to existing processes for further model changes. Click OK. The process definition is created. Open the screen BPM → Process Definitions. Open the 'Contract approval' item for editing. Change the Code field value to contractApproval. We will search the process definition object by this code later in this chapter. 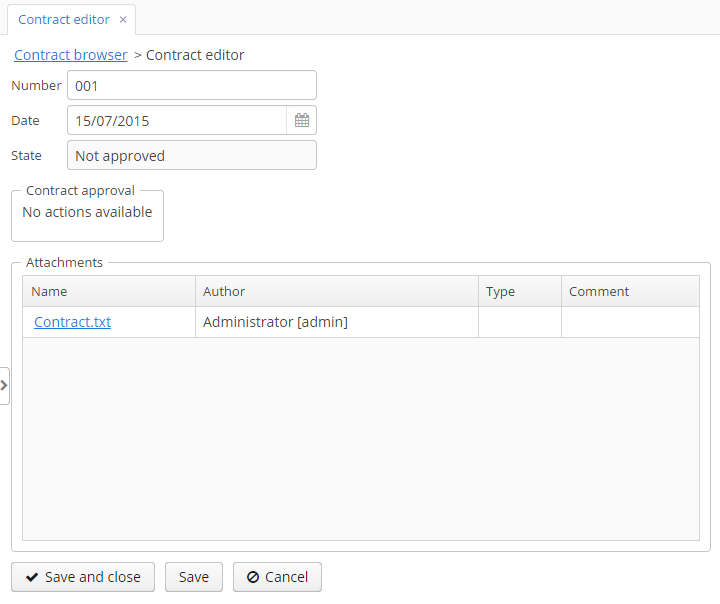 In this section, we will add an ability to work with the contract approval process to the contract editor screen. 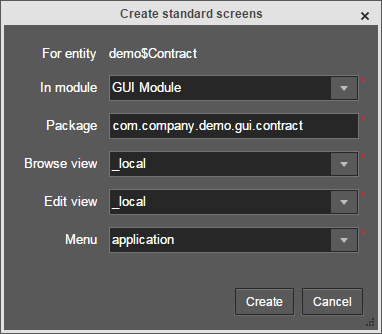 The screen contains a FieldGroup for contract editing, a frame for displaying process actions, and a table with process attachments. Let’s examine the controller code in details. To start the process, we have to create an instance of the process (ProcInstance object), link it to a process definition (ProcDefinition object), and perform start. The process instance can be started both without a link to any project entity and with this link. In our case a link to the contract is mandatory. In the beginning of the postInit() method an instance of contract approval process is searched by findProcDefinition() method, which searches for a process definition with the contractApproval code. Next, there is a check whether a ProcInstance object linked with the contract exists in the database (findProcInstance() method). If the process instance object doesn’t exist, then it is created, the relation to ProcDefinition is set, and a linked entity name and identifier are filled. CommitListener adds the created ProcInstance object to the list of entities that will be sent to the middleware for be committed. Next, go to the initProcActionsFrame() method. A ProcActionsFrame is a standard frame displaying the buttons with available process actions. ProcActionsFrame is linked with a ProcInstance instance. If the process is not started yet, the frame will display the start process button. 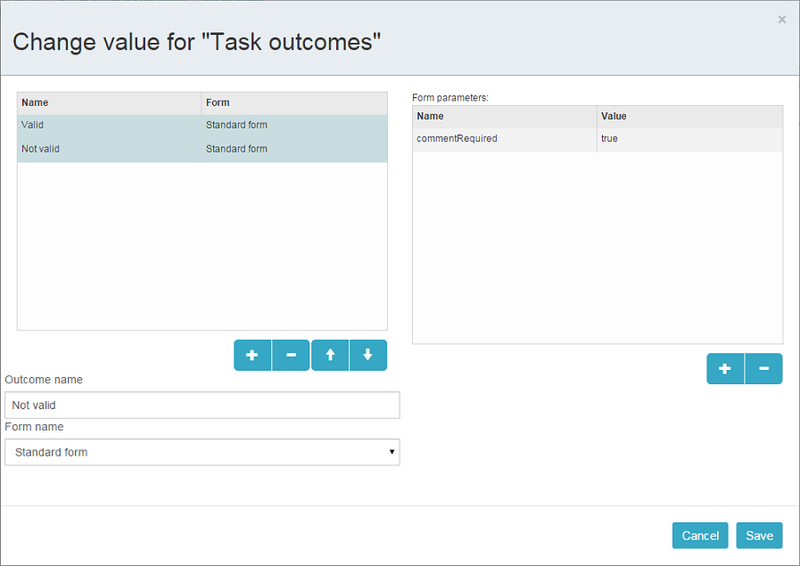 If the process is started and there are active tasks for the current user, then the frame will display buttons for task completion according to the task outcomes defined in the process model. For the detailed information about ProcActionsFrame see Section 6.1, “ProcActionsFrame”. The procActionsFrame.setBeforeStartProcessPredicate() method adds the check that is performed before the process start. If the contract is not saved yet, the process will not start and the warning message will be shown. The procActionsFrame.setBeforeCompleteTaskPredicate() method invokes an editor commit and allows to complete a process action only if the editor commit was successful. setAfterProcessStartListener and setAfterCompleteTaskListener methods will be invoked after corresponding events. They will show the notification and close the contract editor. After all necessary listeners and predicates are set up, the initialization frame is invoked. 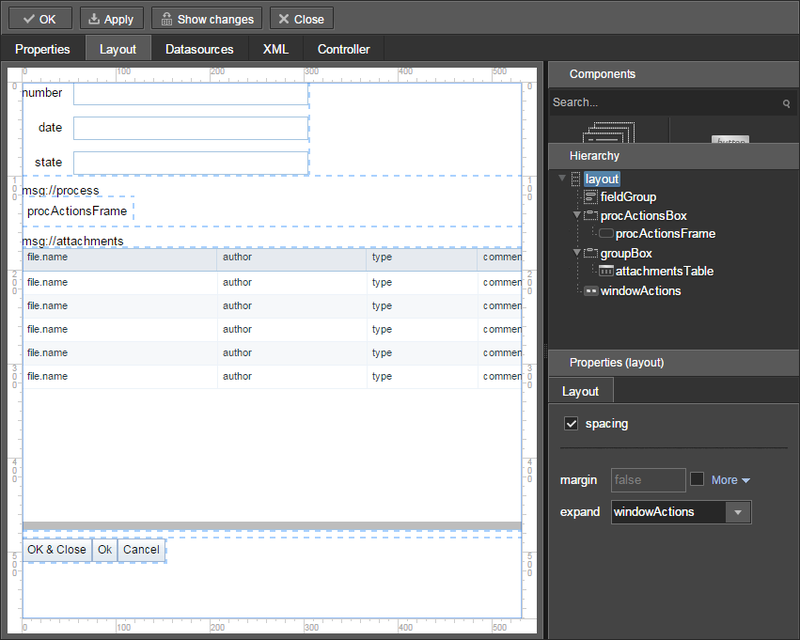 UI components are created during the frame initialization. Hot deploy mechanism is enabled in Studio by default, so all changes in screens should be already sent to the application server. If Hot Deploy is disabled then restart the server in Studio with the Run → Restart application server command. Open the contract list Application → Contracts and create a new contract. Fill Number and Date fields, and click Save button. Click Start process button, the start process form should appear. During the model creation we defined the Standard form with attributes procActorsVisible=true and attachmentsVisible=true for the Start event node. That’s why now we see the form with the process actors and attachments tables. Enter a comment and add actors: the controller is norman and the 2 managers are pierce and roberts. Add an attachment by using an Upload button from the attachments table. Press OK. Now the process is started. 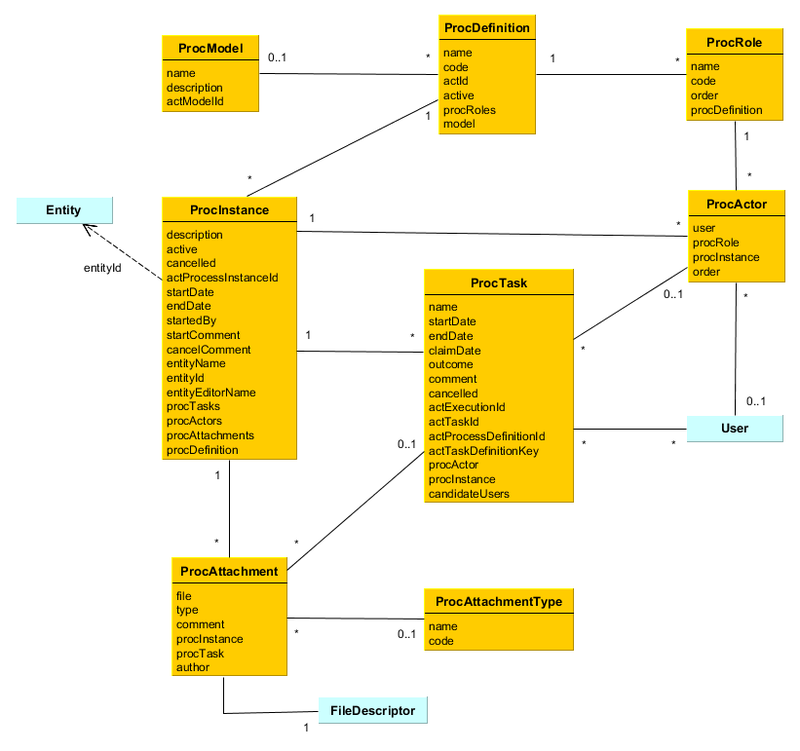 When a process reaches the User task node, a ProcTask object is created. This object is linked to the particular process actor. 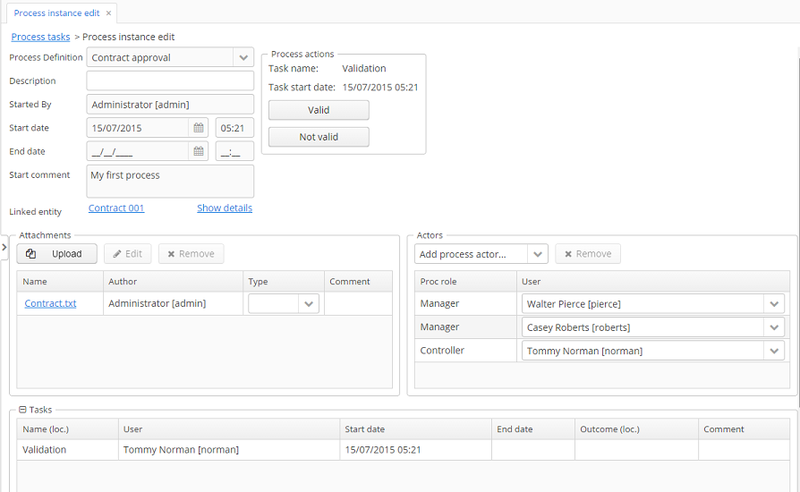 The BPM subsystem has a screen for displaying the uncompleted tasks for the current user. Open it: BPM → Process tasks. It displays the information about the process start time, initiator, attachments list, actors list, process instance tasks list. The screen also allows you to open the linked entity editor and execute a process action. 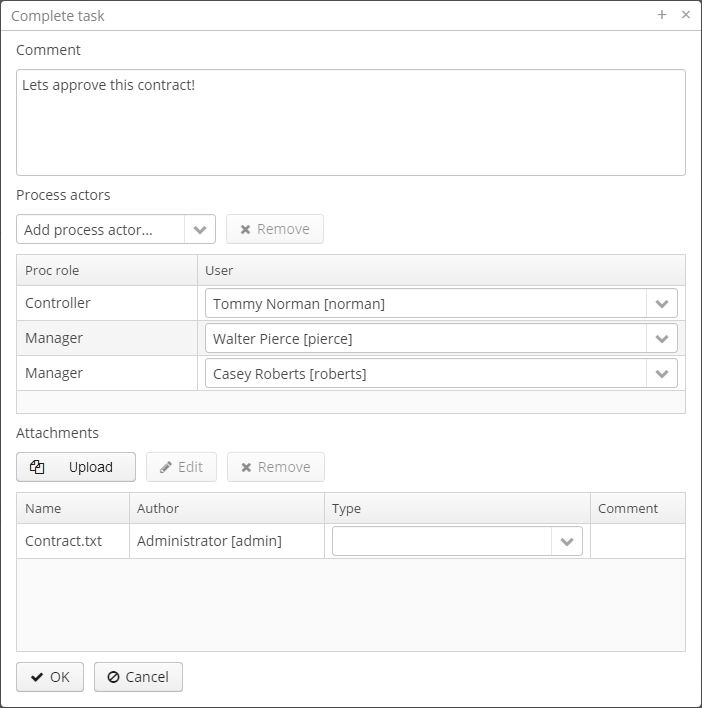 We will complete a process task in another way - using procActionsFrame that we added earlier to the contract editor. Close the Process Instance Edit screen and open the contract instance. The current user (norman) has an uncompleted task (ProcTask), so the procActionsFrame displays available process actions. When we were defining the Validation UserTask node, we set 2 possible outcomes: Valid and Not valid. That’s why 2 buttons are added to the procActionsFrame. After the successful validation the contract should go to managers parallel approval. Log in as the pierce user. Open the current task list BPM → Process tasks. There is the Approval task there. Open the Process Instance Editor. Pay attention to the Tasks table. The previous task Validation has been completed with the Valid outcome, and 2 new Approval tasks were created for managers pierce and roberts. Approve the contract pressing the Approve button. Then log in as roberts. Open the contract from the list Application → Contracts. User roberts has an uncompleted task, so the procActionsFrame displays Approve and Reject actions. Click the Reject button. When we were defining the Reject outcome in the model designer, we set a commentRequired form parameter to true, therefore you see that the comment is required in the task complete form. Enter the comment and press OK.
One of the managers has rejected the contract, so the Not approved state should be assigned to the contract. Let’s check it. Open the contract. The approval process is completed with the Not approved state. Attributes which names start with *act prefix are references to the Activiti identifiers. name - the model name. description - the model description. actModelId - ID of a model from Activiti engine, stored in ACT_RE_MODEL table. code - the process code. It can be used to determine an entity instance from the application code. actId - ID of a process from Activiti. active - defines, whether a new process instance start is allowed for the current ProcDefinition. procRoles - collection of objects that defines process actors. model - the reference to a model. name - the role name. code - the role code. It can be used by an application for a role identification. order - the order number. It can be used by an application to display roles in an appropriate order. procDefinition - the reference to a process definition. description - the description of a process instance. startDate - the process instance start date. startedBy - the user who started a process. active - the indicator that shows if a process was started but hasn’t been completed yet. cancelled - the indicator that shows if a process was canceled. actProcessInstanceId - the identifier of the corresponding ProcessInstance from Activiti. startComment - the comment on process start. cancelComment - the comment on process cancel. entityName - the linked entity name. entityId - the linked entity ID. entityEditorName - the screen name that will be used to edit the linked entity. procTasks - the process tasks collection. procActors - the process actors collection. procAttachments - the process attachments collection. user - the reference to a user. procInstance - the reference to a process instance. procRole - the reference to a process role. order - the order number. The field is used to define the order of actors for a sequential task for multiple users. name - the task name. startDate - the task start date. claimDate - the claim date. The field is used in a case of a task without an explicit process actor. endDate - the task end date. outcome - the task completion result. comment - the task completion comment. actTaskId - the Activiti task ID. This field is used to report the Activiti engine about task completion. actExecutionId - the Activiti execution ID. This field is used for process variables read/write. actTaskDefinitionKey - in a process XML it is an id attribute of the UserTask element. It is used for building a name of a variable that stores the task result ([task_id]_result). See Section 4.6, “Transitions Depending on Task Outcomes”. cancelled - the identifier that shows if the task was completed on process cancelation. candidateUsers - the list of possible process actors for a group task. file - the reference to FileDescriptor. type - the attachment type (ProcAttachmentType). author - the reference to the author of an attachment. procTask - the optional reference to a process task. code - the attachment type code. name - the attachment type name. The BPM subsystem employs the Activiti Engine for business processes execution. 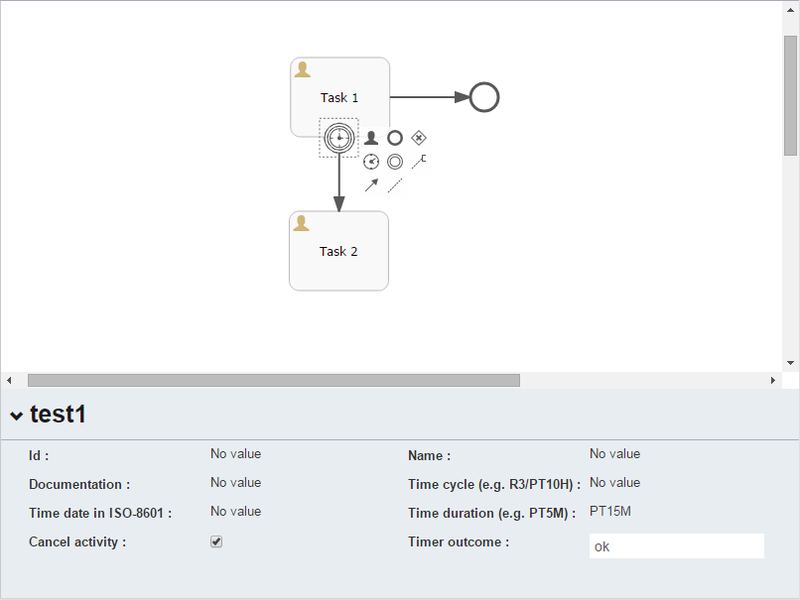 The modified editor from Activiti Explorer is used to model processes using BPMN 2.0 notation. In addition to Activiti framework capabilities, the BPM subsystem provides additional functionality which is described in this section. A description of the Activiti framework is out of this manual scope and can be found at http://www.activiti.org/userguide. The BpmActivitiListener event listener is automatically added to the process when a model is created. BpmActivitiListener implements the ActivitiEventListener interface (see http://www.activiti.org/userguide/#eventDispatcher). The listener is responsible for creating and modifying BPM entities when some process events occur (e.g. a user task entering, process cancelation, task completion, etc). This is the listener that creates ProcTasks objects and sets the endDate value for a ProcInstance. Process roles define process actor types, e.g. operator or manager. 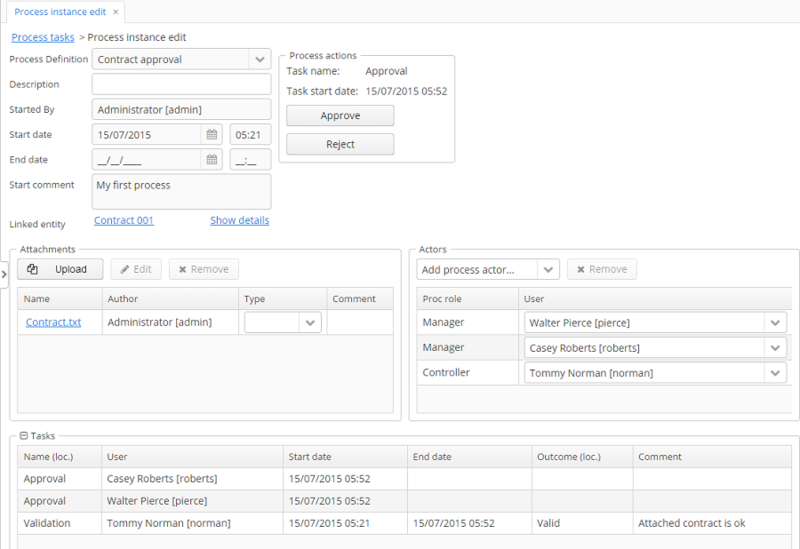 To open the process roles editor select the Process roles property in the model properties panel. Information about the roles will be written to the process XML (extensionElements section of the process element) during the model deployment. Process roles definition in a process XML. 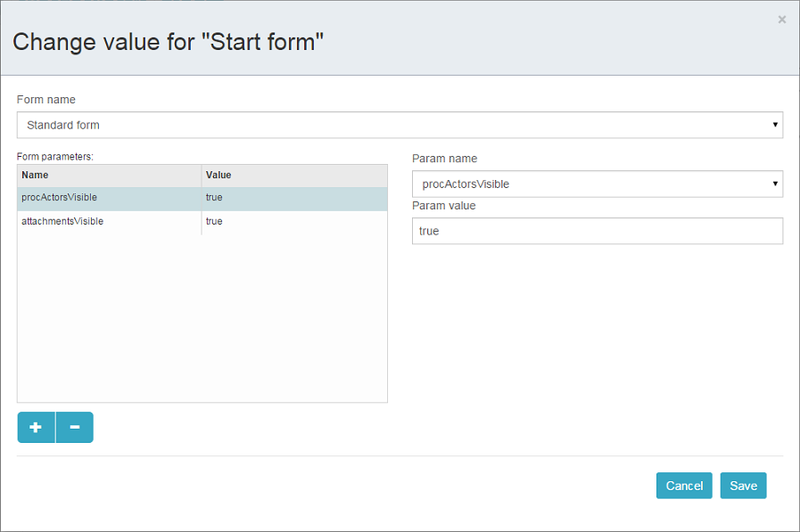 To define a form that will be displayed on the process start, use the Start form property of the Start event node. Read mode about forms at the Section 6.2, “Process forms” section. Process start form definition in a process XML. To define the task assignee, select one of the process roles in the Process role property of the User task node. When a process reaches the User task, process actors with the given role will be found among all the process actors, and the task will be assigned to them. Process role form a task in a process XML. If you want the task to be assigned to multiple users, then set Parallel or Sequential value to the Multi-instance type property of the User task node. Set the Claim allowed property if you don’t want the task to be immediately assigned to the particular user, but to appear in the list of available tasks for the group of users. Then, one of the candidates will be able to claim the task. Task candidates are defined amongst process actors with the corresponding Process role property. A task without an explicit executor in a process XML. Commonly, a user is expected to make a decision on the task, e.g. to approve or to reject the contract. The next route through the process depends on this decision. The Task outcomes property of the User task node is used to define the list of outcomes. The name and from, that should be displayed when an outcome is selected, can be defined for each outcome spearately. The parameters that should be passed to the form can be defined as well (see Section 6.2, “Process forms”). Unlike jBPM, BPMN 2.0 notation doesn’t provide the way to define multiple outcomes for a User task. To make a process to be continued on a required flow node, the Exclusive gateway is used. Its outgoing flows have conditions that operate with the results of the preceding task. When a user completes the task, its result is written to the process variable with the name generated as [taskId]_result. The variable type is ProcTaskResult. int count(String outcomeName) - returns the number of users who completed the task with the given outcome. boolean exists(String outcomeName) - returns true if there are users who completed the task with a given outcome. The resultant object of the task completion is used in the Flow condition expression of gateway outgoing flows. Let’s suppose that the approval task was assigned to multiple uses in parallel. There are 2 outcomes defined for the task: approve and reject. When all users have completed the task, the process goes to the exclusive gateway. We want to implement the following behavior: if anyone choses the reject option then go to the Rejected flow; if everyone approved the task then go to the Approved flow. The simplest way to define the flow condition is to select the name of the previous task outcome in the Flow outcome property of the flow node. The flow will be activated if there was at least one task completion with the selected outcome. Please notice that the flow order must be defined. Otherwise, Activiti could process the default flow before the flows with explicit conditions. To define the flow order use the Flow order property of the Exclusive gateway node. The Script task node is used to evaluate a script. The system analyzes the content of the Script property value. If the value is a valid file path and the file exists, then the script from the file will be executed, otherwise the Script field will be evaluated. Note that you are allowed to use persistence and metadata objects for scripting. Add the Boundary timer event node to the task node. Draw the flow from the timer node to the other required node. Define an expression for the time interval in the Time duration property of the timer node. For example PT15M is an expression for 15 minutes interval. Set the Cancel activity property to true. That will cancel the current task when the timer is fired. In the Timer outcome property define the task outcome that should be used when the task is completed by the timer. Defining an outcome for the timer. 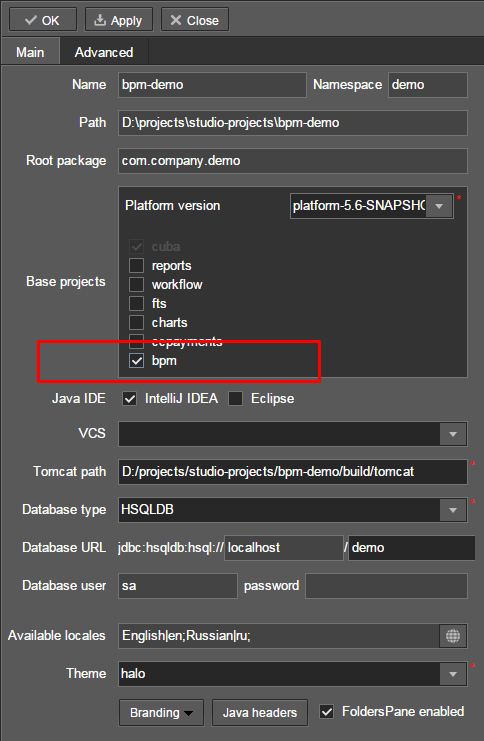 By default, the Job executor which processes timers is disabled. To enable it, set an application property bpm.activiti.asyncExecutorEnabled = true. A process may contain localized messages that are used to display task or outcomes in the user interface. To open the localized messages editor, select the Localization property in the model properties panel. To localize the task name, create a record with the task id as a key. To localize the task outcome name, create a record with an expression like TASK_ID.OUTCOME_NAME as a key. 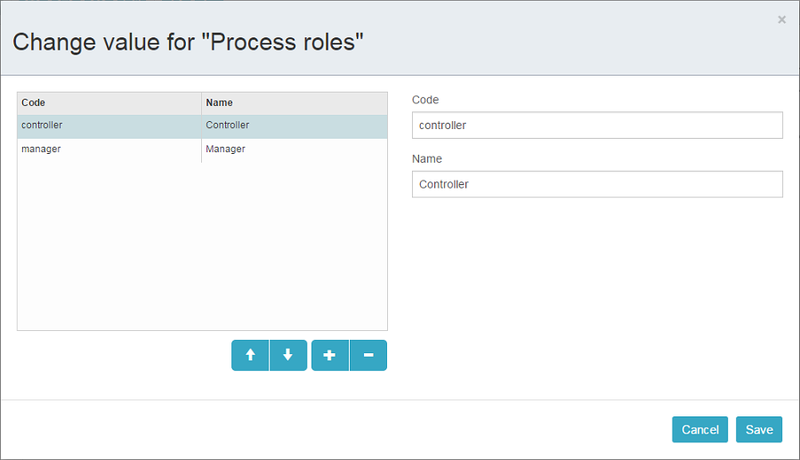 To localize the process role name, create a record with a role code as a key. A Sub model node of the Structural group allows using an existing model as a part of a new model. While deploying a process submodel elements are being inserted to the current model, and a process XML is produced from the result of this concatenation. The chapter contains only general description of the services. Detailed service methods description is available in Java classes documentation. To access the service functionality on middleware layer use the ProcessRepositoryManager bean. To access the service functionality on middleware layer use the ProcessRuntimeManager bean. To access the service functionality on middleware layer use the ProcessFormManager bean. The service is used to access the localized messages which are defined in the process. To access the service functionality on middleware layer use the ProcessMessagesManager bean. The service is used to create and update models in Activiti internal tables. Also it serves to work with the JSON representation of the model. The predicative listener can be assigned to each of the process actions in order to check if the action can be performed (e.g. predicate commits an editor and if the commit failed, a process action is not performed). The post-action listener can also be defined (e.g. listener will close the editor and show the notification). String getComment() - returns the value that will be written to the comment field of the ProcTask object or to the startComment field of the ProcInstance if the form is displayed on a process start. Map<String, Object> getFormResult() - returns a list of objects that will be added to process variables after the form commit. A list of forms available in a process model designer is built according to the configuration files that are defined in a bpm.formsConfig application property. The above also describes available form parameters with their names and default values. A form with a default="true" attribute will be used as the default form in the model. Possible values: true or false. Defines whether Job Executor for timers and asynchronous tasks is enabled. The default value is false.